For the final edition of the UR-110 model, Urwerk's founders Martin Frei and Felix Baumgartner decided to do something even more original than what they usually do. First, they used wood for the bezel of the two models. 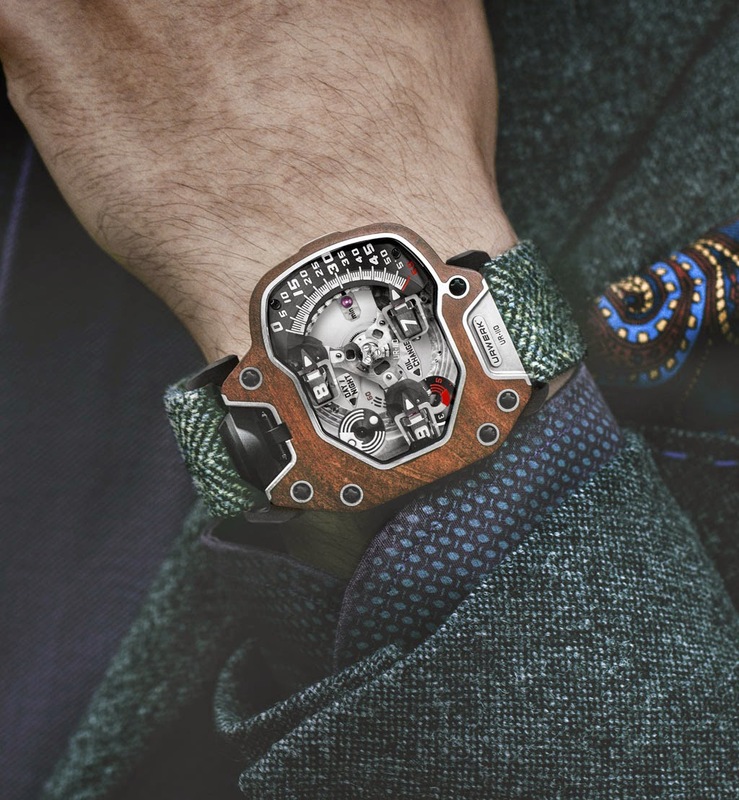 Second, they matched the watches to tailor-made tweed straps. 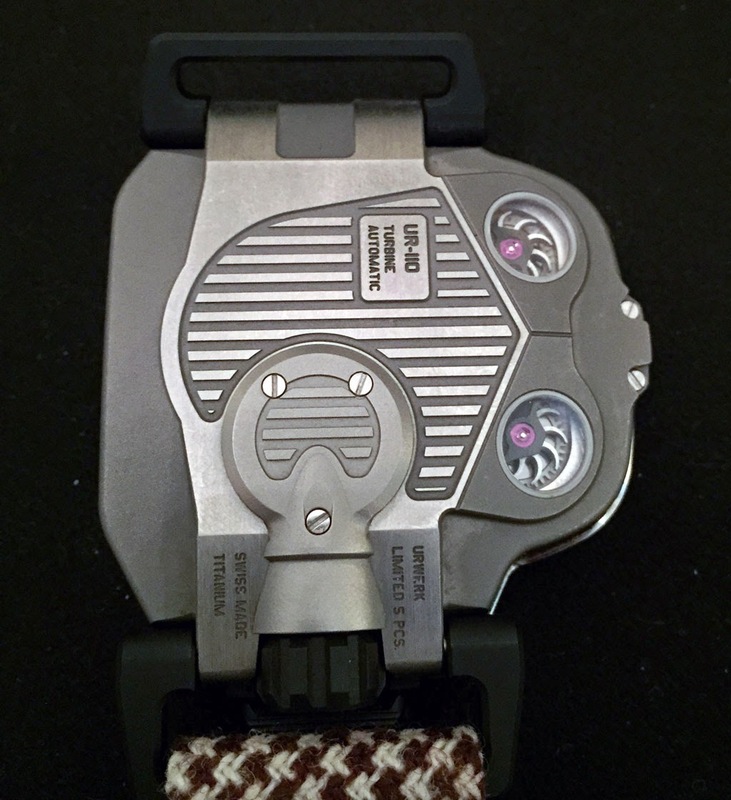 As a result, the new Urwerk UR-110 EastWood truly stands out for its uniqueness. Only ten pieces of the EastWood will be produced, five pieces with South African Red Ivory wood bezel and five with Indonesian Macassar ebony bezel. As you can imagine, carving a rounded bezel out of very hard woods like the ones used for this project and then have it perfectly integrated in the titanium construction of the UR-110 was a big challenge. 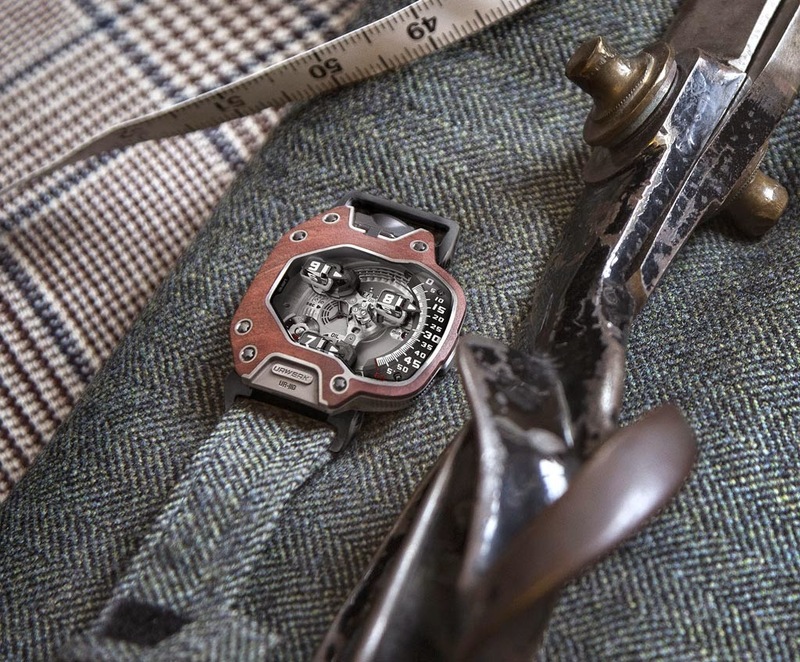 For the straps, Urwerk asked support to Timothy Everest, the famous Welsh bespoke tailor. The choice went on fine wool tweed, perfect for durability and wearability. One of the patterns used is the original Prince of Wales check worn by the Duke of Windsor. Contrary to popular belief, this tweed is actually brown and blue on ivory fabric but because of being seen mainly in newspapers, was generally thought to be black and white. Winner of the 2011 Grand Prix d'Horlogerie de Genève prize for Best Design Watch, the UR-110 uses orbiting satellite complications to show the time on the right side of the watch. Three hour satellites follow a vertically arced line, graded from 0 to 60 minutes, in a downward motion. Planetary gearing keeps the satellites and their arrow-shaped "torpedoes" in parallel formation as they take turns to indicate the time as they pass the 60-minute track. - A central carousel providing the complication with stability and equilibrium. - Planetary gearing assuring the parallel rotation of the three hour satellites as they orbit the dial. - Three counter-rotating hour modules - each mounted on a planetary gear and comprising an hour satellite, minute hand and counter balance. These three modules are in constant counter-rotation to counter the direction of rotation of the central carousel. As well as indicating the hours and minutes, the UR-110 EastWood also features a Control Board on the dial side with indicators for "Day/Night" and "Oil Change" as well as small seconds on a sub dial. Turning the watch over, the titanium back encloses the innovative automatic winding system which uses twin turbines to minimise wear. In fact, with their curved shapes, they offer increased air resistance to the rotor's free direction of spin and less resistance to its winding rotation. 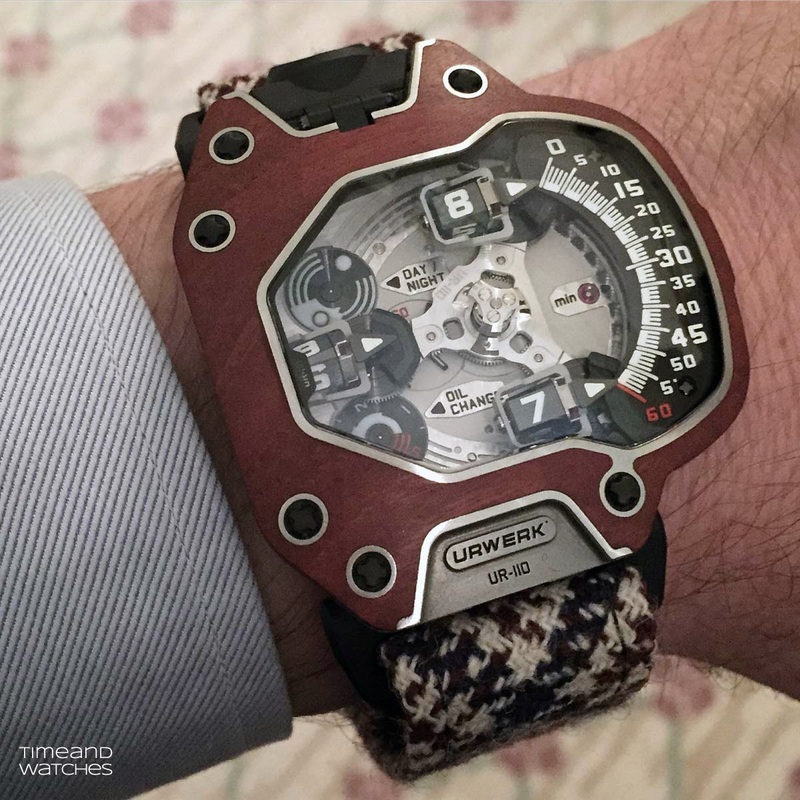 Urwerk UR-110 EastWood. 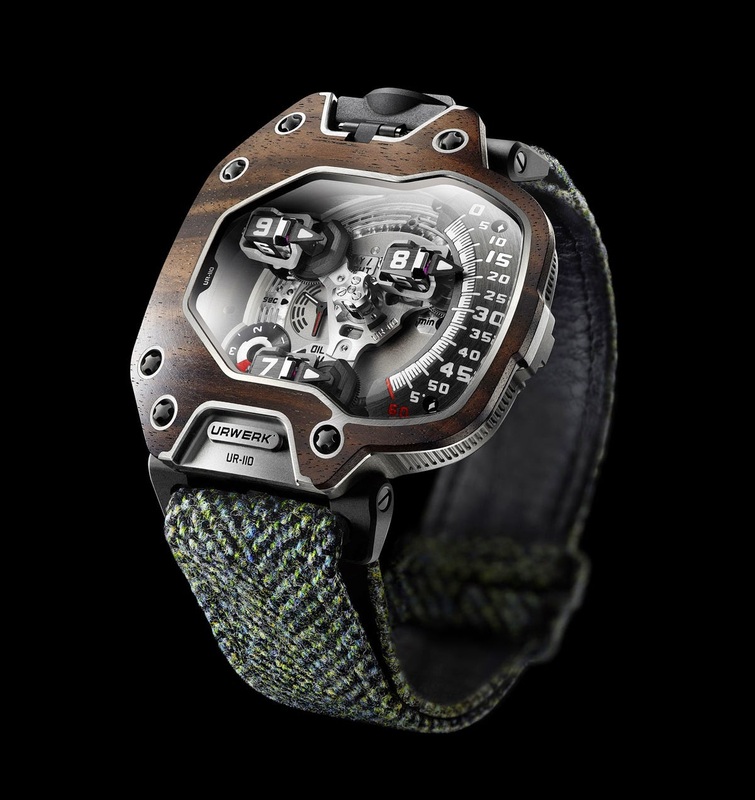 For the final edition of the UR-110 model, Urwerk's founders Martin Frei and Felix Baumgartner decided to do something even more original than what they usually do. First, they used wood for the bezel of the two models. 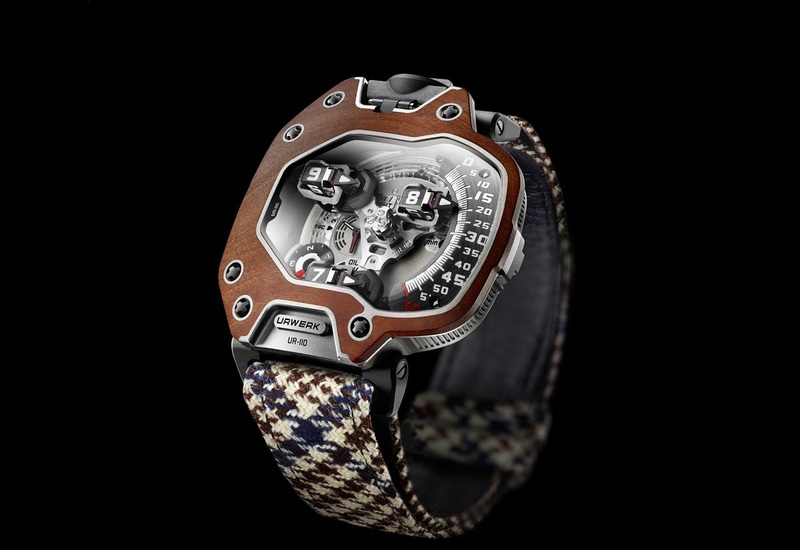 Second, they matched the watches to tailor-made tweed straps. 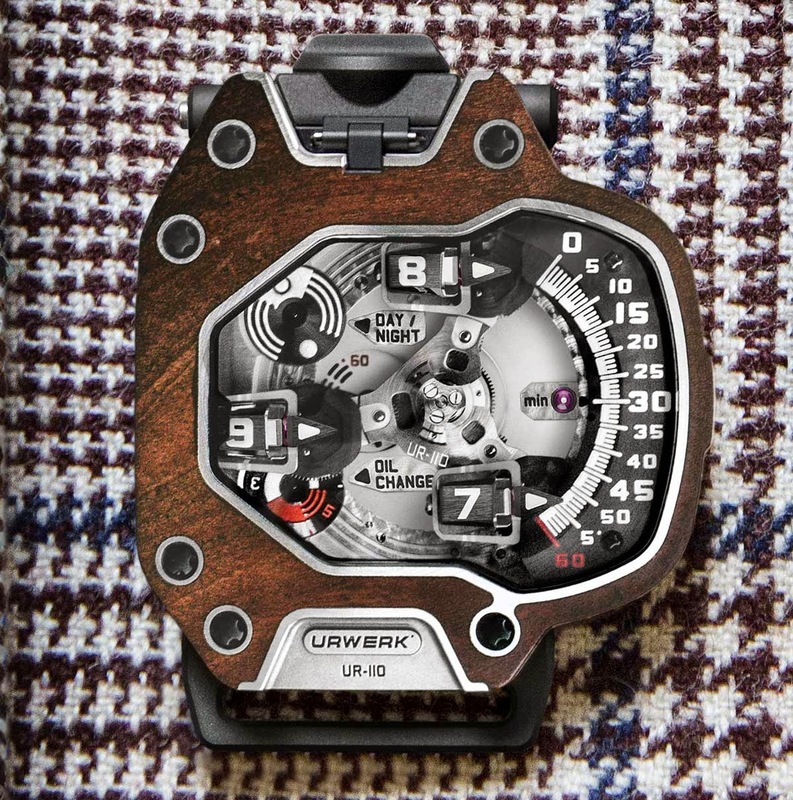 As a result, the Urwerk UR-110 EastWood truly stands out for their uniqueness. Only ten pieces of the EastWood will be produced, five with Indonesian Macassar ebony bezel and five pieces with South African Red Ivory wood bezel.